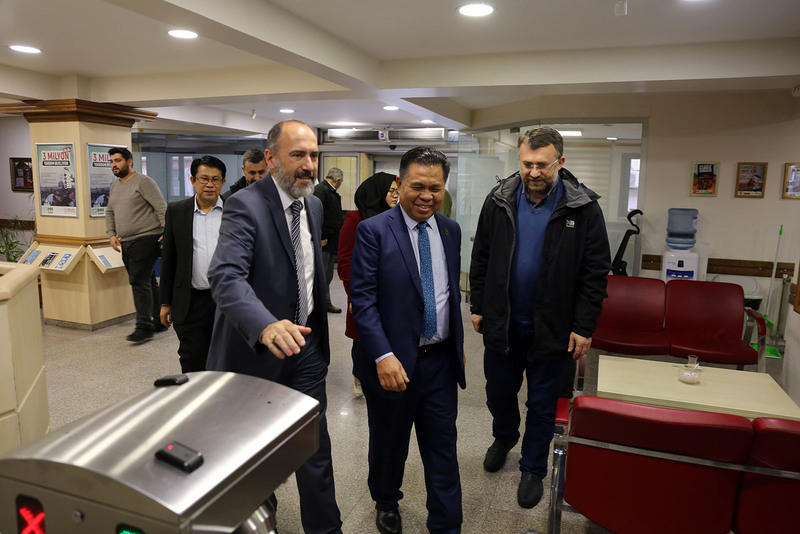 Moro Islamic Liberation Front Leader Al-Hajj Murad Ebrahim and his delegation who are on a visit to Turkey for various talks, visited IHH Humanitarian Relief Foundation Headquarters and assessed the latest developments in Moro. Al-Hajj Murad Ebrahim was welcomed by IHH Executive Board Member Huseyin Oruç, IHH Board Members Izzet Şahin and Vahdettin Kaygan, and orphaned girls that IHH supported in Moro with the Orphan Support System and later brought to Turkey to study. During the visit, they discussed the developments after Philippine President Rodrigo Duterte signed the Bangasamoro Organic Law, IHH’s role in the peace process and new projects in Moro. With the agreement signed in 2014 under the supervision of IHH Humanitarian Relief Foundation that gives extensive rights to the Muslims in the region, the civil war that continued for more than 40 years officially ended. The monitoring committee closely supervised the ongoing negotiation process between the Philippine Government and the Moro Islamic Liberation Front and made great efforts to materialize the agreement, and as a result the agreement came into force on approval of both the Philippine Government and Parliament. The monitoring committee consisting of five members included the former EU Ambassador Alistair MacDonald, IHH Humanitarian Relief Foundation Executive Board Member Huseyin Oruç, Steven Rood from the Asian Foundation, Karen Tanyada from Gaston Z Ortigas and Priest Kuthdo from UNYPAD. With the approval of the autonomy law known as the Bangasamoro Organic Law by President of the Philippine Government Rodrigo Duterte on 26 July 2018, the dispute that expanded over half a century and led to the deaths of 120 thousand people, ended. In August 2018, following the signing of the Bangasamoro Organic Law Moro Islamic Liberation Front Leader Al-Hajj Murad Ebrahim sent a letter of thanks to IHH that contributed to the peace process. In the letter thanking IHH President Bulent Yıldırım, Executive Board Member Huseyin Oruç and IHH personnel for the efforts they made for the Moro Muslims, Ebrahim also said he was extremely grateful to the Turkish government and the Turkish Muslims for their support. Since 1996, IHH Humanitarian Relief Foundation has continued its efforts in Moro. IHH is conducting operations in various fields in the region including Ramadan, Qurban activities; humanitarian aid, emergency aid, orphan works, human diplomacy and permanent works. Additionally, IHH, which is continuing the construction of schools, mosques, kitchens and orphanages as a part of the construction of permanent works, plans to open 5 new permanent works within the next week.